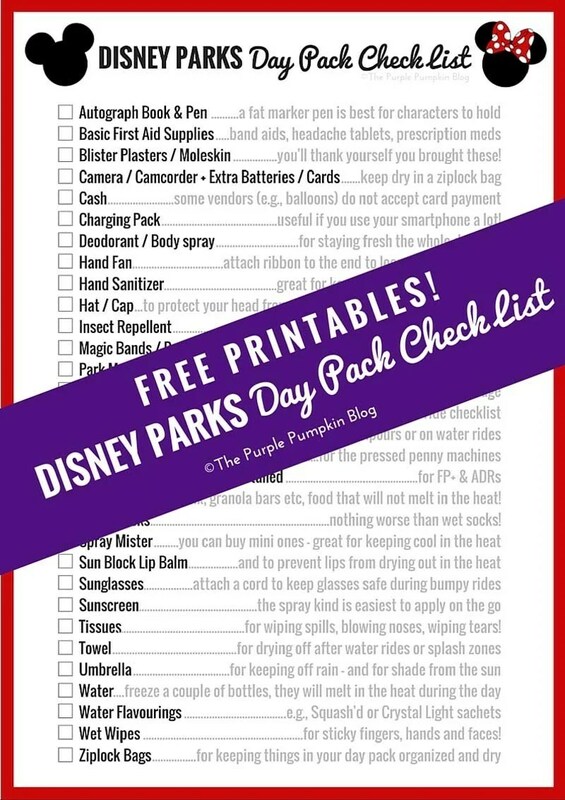 Disney Parks Day Pack Checklist - Free Printables! We have always taken a day pack with us when visiting any of the parks at Walt Disney World. We have never found it a hindrance to take a bag with us – sure, we have to go through bag check before entering the park, but if you are prepared – bag opened and ready to be searched – it’s a quick process. Plus, you don’t all have to line up – just the person with the bag, so everyone else can go and enter the park and wait for the bag holder. The type of bag you take is up to you – we use a backpack which my husband is in charge of carrying. It sits on his back (of course! ), and it’s easy enough for one of us to reach into it to grab something we need. I’ve seen others with oversized handbags, shoulder bags, bum bags (fanny packs), drawstring tote bags… take whatever you feel most comfortable carrying all day long. The checklist of items is for guidance only – do not feel you need to take ALL the things with you! Ones that I’ve marked with an asterisk are what I consider to be essentials, and what we could not do without. It’s also a good idea to pop a card with your contact details – name and phone number – should you mislay your bag, it will be easier to find you and reconnect you with your stuff!
) – are a good choice as the characters can hold these easier. There are first aid areas at all of the parks, but a couple of plasters/band aids, and some headache tablets or pain killers might be needed just when you’re on the opposite side of the park. You don’t need to take the whole box, a few of each should be enough. If you need to take prescription medication, remember to bring this with you. You may be wearing the most comfortable shoes you own, but there are times when a blister might occur – don’t be caught out, have some blister plasters or moleskin in your day pack to protect the area from further irritation.
) so do not need to carry around extra lenses – I would imagine that would need a separate camera bag. My camera hangs around my neck all day, but goes in the bag on some rides, and into a ziplock bag on water rides to protect from potential water damage. Similarly, batteries and memory cards also get stored inside the ziplocks to protect them. When we stay onsite at a Disney Resort, we charge all of our Disney parks purchases to our room; however, there are some vendors that only accept cash – the balloon sellers are one that spring to mind, so we always take some cash with us. You can pay with debit/credit card in pretty much every store, restaurant and snack cart, so you don’t have to worry about brining hundreds of dollars out with you. If you are out all day from early doors until park closing, it’s likely that your phone will run very low on battery. There are some places that you can charge your device, but they are few and far between. Many these days are slender and lightweight and take up little room in a bag. When you’re down to your last 5% and want to take a few more photos of your day, you’ll be thankful that pack is in your bag! Florida is hot, and walking around a theme park all day is going to work up a sweat, whether you like it or not! Stay fresh with a travel size deodorant or body spray to freshen up. This is my number 3 item – after park tickets and camera! I could not survive in that heat without my hand fan! 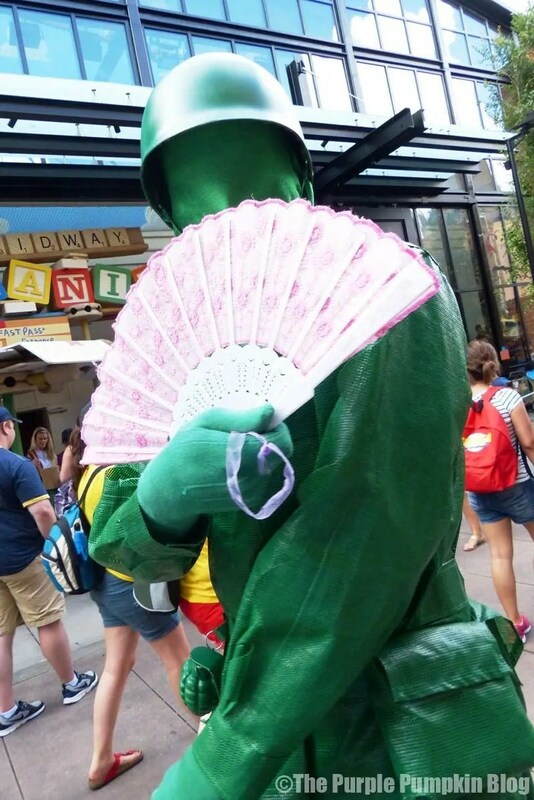 So many people have stopped and asked me where I got it from when they’ve seen me cooling off with it – characters and Cast Members have even asked to borrow it in the heat! Tie a ribbon around the end so that you can loop it round your wrist and always have it to hand to waft up some cooling air around you. Again, doesn’t have to be a big bottle, a small travel size one is handy to have, just in case you put your hand down on something icky and need to clean up. I guess these don’t strictly go into a day pack, but on your head. I personally don’t wear a hat – makes my head too hot, but my husband and son do. We have never had a problem with bug bites in Florida, but if you are a beacon for mozzies and the like, then take a small can along with you. You can also buy repellent wipes which are very handy instead of a spray bottle. This is the #1 item that you cannot forget! Without your Magic Band (free if you stay onsite at a Disney Resort, or you can purchase them if you are staying offsite) or park tickets you will not be entering any theme parks that day. Put the bands on your wrists, and double check everyone has theirs on before you step out of the door. Put park tickets in a lanyard to keep them all safe. These can be picked up at all of the Disney Resorts, as well as at park entrances. We always pick up 2, as invariably one will get grubby, or torn, or lost, so it’s good to have the back up! You can get around without one if you know the park well, but I would suggest that all newbies have one to hand so that you can find things easily. If you plan on buying alcohol, you may be asked for proof of age. The only proof is photo identification – this could be your driving license or passport (a laminated colour photocopy is often fine). We always have our driving licenses as we hire a car. If you have paid for planning services, or written out an itinerary for your day, don’t forget to bring it with you! 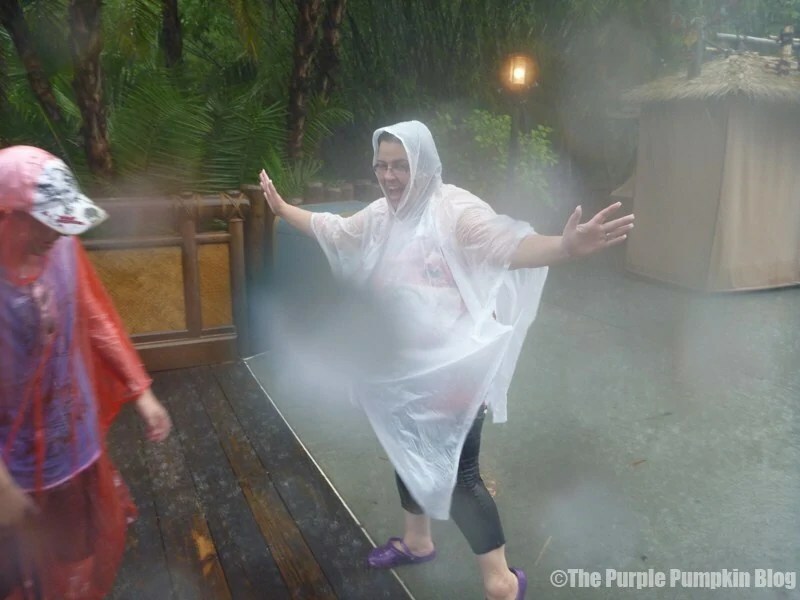 The rain can come out of nowhere in Orlando, so be prepared to throw on a poncho. You can pick them up cheaply in places like Wal*Mart, or you can buy them at the gift stores in the Disney parks. A cheap souvenir are pressed pennies. There are lots of these machines scattered all across Walt Disney World, so make sure you have a supply of quarters and 1 cent coins to use in the machines. Most take 2 quarters, and 1 penny. Some take a dollars worth of coins, and you press a quarter. We rarely take snacks into the park with us, but if you have young children, you may find it cheaper to bring a few snacks in with you – things that don’t melt are your best bet – pretzels, potato chips, trail mix, and granola bars are good choices. There is every chance, if you go on a water ride, you will get wet! Wet socks are no fun, and can cause blisters, so a spare pair thrown in your bag will be very handy. You can buy these in the parks, but they are quite big and cumbersome. But they are a welcome relief when the Florida sun is beating down on you whilst your watching the parade, or waiting in line. You can buy smaller ones in the American supermarkets. Dry lips are the worst – because they can become very painful if not dealt with. A lip balm with sun block in it will provide a dual purpose and takes up no room at all.
) to attach to our glasses – can it keeps them from flying off when on bumpy rides.
) since we started visiting Florida in 2011. It’s a sunscreen that protects very well, and is easy to apply as it is a spray. It is slightly more expensive than some other brands, but for us, it is a must buy. One of those handy travel packs is light and small enough to pop in your bag – to wipe up spills, blow noses, or wipe away tears – of joy we hope, but also for other types of tears! We don’t carry these around with us – way too cumbersome, but we do leave a few in the trunk of the car. Experience has taught us that sitting down in wet clothes in a car is not a pleasant experience! We’ve also spent a lot of money on theme park towels when we didn’t have this knowledge on our first trip! I see smart people walking round with these to shade from the sun. Similarly, to protect from the rain. We don’t bother with a brolly, but if you want to, buy a small compact one. Now, you can ask for cups of iced water at any counter service, which is grand, if you happen to be near one, and the line isn’t long. But in the heat you need to stay hydrated, so take a bottle of water for each person in your party, plus one extra. There are water fountains dotted around the park where you can refill your bottles. We always freeze three bottles and take one from the fridge. The heat soon starts to melt the frozen bottles, and we have ice cold water for a while. If you’ve been to Orlando before, and you’re a Brit, it’s likely that you’ll find the water has a strange taste to it. I know we do… to solve that problem, we are taking some of those tiny bottles of fruit squash with us this year to combat that taste! Crystal Light are sachets of drink mix you can buy in the American supermarkets, that you could also use. These are always handy – for wiping sticky hands and faces, or for freshening up. We compartmentalise everything in our bag, using ziplock bags – they keep things dry and clean, and are easy to pull out. We take extras for things like wet socks, wet ponchos, or for storing the camera and camcorder during the wet rides. There are a few more things you may want to consider – depending on your circumstances really. Baby food/formula – you can also ask for free hot water at counter service restaurants. Bathing suit for children – there are splash areas in some of the parks. Chewing gum – you won’t find this for sale anywhere in a Disney Park. Please be considerate when disposing. ID for kids – you can buy bands these days, as well as temporary tattoos. Always tell children where they should go, should you get separated. Light jacket/sweatshirt – the air-con can be freezing when dining, so you may want to have something to cover up with. Notepad/pen – if you want to make notes about your day. Small torch – for seeing park maps at night – or download an app to your smartphone. Wash cloth/flannel – wet with ice cold water and wrap around the back of your neck to keep cool. Of course, you can take all of these things, some of these things, or none of these things (except your park entrance!! ), only you will know what suits you and your family the best! 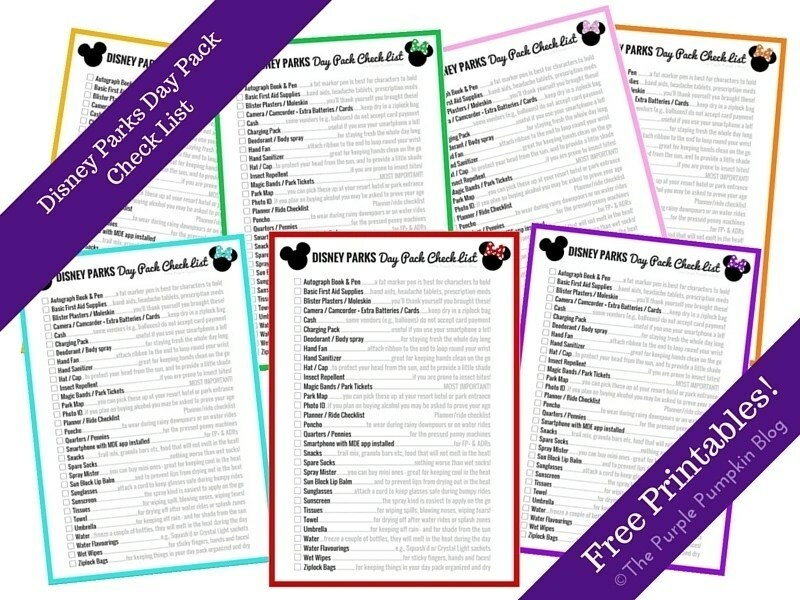 I’ve created some Disney Parks Day Pack Checklist free printables for you to download and print, just use the links below. I’ve provided two different sizes: A4 (UK) and 8.5″ x 11″ (US); there are 7 different colours to choose from – just print off the page you require and go pack your bag for touring the Disney Parks! Thanks for reading Day 69 of 100 Days of Disney 2015! 31 to go! Come back tomorrow for another Disney post!